Tea Length: a style where the hem falls between the knee and the calf. 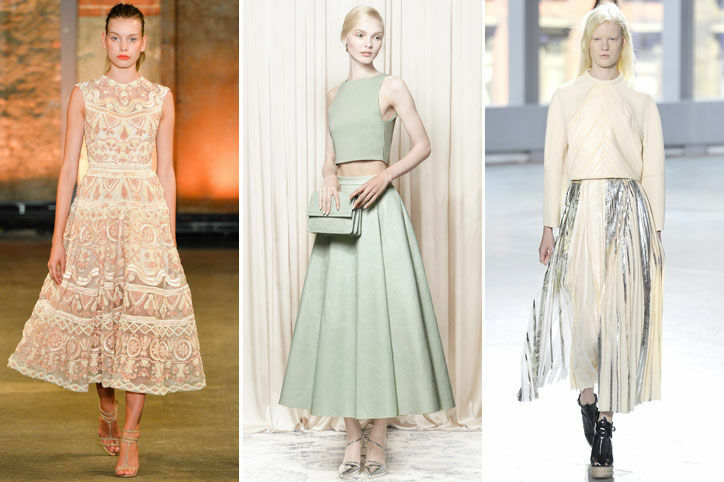 Tea length skirts are seriously all the rage right now. The saying that fashion is going backwards is definitely true in this case. Tea Length has been seen way back in the late 1800’s in England and the US. Now, people wear it to look old fashioned or modest yet still casual. Patterns and fabrics all vary, so the sky’s the limit. But, the style is always flowy or pleated, as a skin tight tea length would probably restrict ones ability to walk. 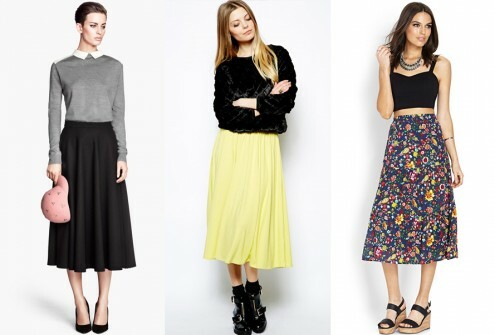 As shown in the picture, you can wear a matching crop top or a sweater with the skirt since it’s so versatile. You’ve probably hear of tea length wedding dresses, but brides usually only choose this style at outdoor weddings or for laid-back weddings. Tea Length is also an option for prom if you’re into that. Again, this outfit is only for the ladies. Envision women in the 20’s when styling a tea length skirt. I suggest tucking in a muted and thinly striped button up into a solid tea length skirt. Make sure the blouse has a collar so you can layer over a pastel or white sweater. Then finish the look with some office-esqe pumps and a watch of choice. The best season to wear these is in the fall or spring, but you could also put it off in the winter. If your style is vintage or elegant than this is the look for you. But if you’re edgy or preppy, then some modifications could help to implement the tea length. Edgy: pair a cropped bomber with a faux leather skirt. Preppy: take a wild pattered skirt and pair it with a bustier of choice. TL;DR: Channel your inner old-school and try out the tea length.